Lots and lots and lots of people in blogworld know CheeseBoy. 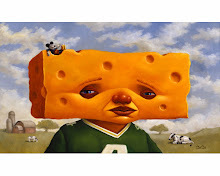 I was first introduced to his blog, The Blog O Cheese, by Marla over at Butts and Ashes. Both of them are hilarious! If you ever need a good laugh, want to get-away-from-it-all, could use a little nonsense in your life, check out CheeseBoy and Marla. Now, not to worry ... more from CheeseBoy on future posts. He is my favorite Cheeseboy, and he deserves to cash in for it. Marla's great, too. Yay for the CheeseBoy! So cool! Thanks for sharing, you are such a darling! Oh nice! It was an honor to be featured. I wish I could have been even funnier in person. Next time I will be more prepared. I will link you up right now! You click on my ads when i post them, i click on yours...lol. Ugh. what if u said u wouldnt click anymore? U R a blogging rockstar! Hilarious video!!! BTW...i think you look like Peter DeLuise. A bit. Haha! Some things you just have to learn the hard way!! Hi there! I came over from Cheeseboy's blog. I am a true fan of his comedic posts. Nice to meet you and BTW, what a beautiful thing you did for your Mom! hahaha thanks for the laugh!!! He is great! This is a life lesson, people! Totally unrelated-I read your profile blurb and I think it is a beautiful thing that you did for your mom. Very precious. I am Cheeseboy's real-life sister. He is a funny guy and we sure appreciate him at family parties! I thought it was interesting that just a few posts ago you interviewed our cousin, Jag. He's an amazing kid and always has been. We love him a ton! His mom and our mom are sisters. I love Cheeseboy. He is scary funny and yet, he looks so normal. BTW...Thanks for the mention, Denalee!! You know…you have so many of the same mannerisms as your boys.